The “Battle of Lexington,” 1775, was portrayed as an unprovoked slaughter of colonists by the British. James Perloff believes that, like the sinking of the USS Maine and 9-11, the event was engineered to start a war, the American Revolution. Freemasons have manipulated Americans into fighting wars from the get-go. America was founded as a Masonic nation, what Francis Bacon called “the new Atlantis” when he supported the original Jamestown colony. I grew up in Lexington, Massachusetts, where on April 19, 1775, a force of British redcoats, on their way to Concord to confiscate rebel munitions, encountered a small force of militiamen. Suddenly, “the shot heard round the world” was fired. In the ensuing skirmish, eight colonists were killed, and nine wounded. The British suffered one wounded. This was a causus bellum for the American Revolution.But, was “the shot heard round the world” a false flag like 9-11, a pretext for war? As explained in detail my online article The Secrets Buried at Lexington Green, Americans were deceived. It was proclaimed everywhere that the British had committed an unprovoked massacre in Lexington. The truth is individuals in concealed locations fired on the British first. Adams, left, Temporary Secretary of the 1774 Philadelphia Congress, had secured a pledge from delegates that, should warfare erupt between Massachusetts and British troops, the other colonies would aid Massachusetts. But this carried a stipulation: They would only help IF THE BRITISH FIRED FIRST. By mid-April 1775 the SECOND Continental Congress was 3 weeks away. 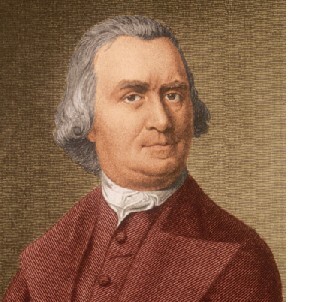 Sam Adams desperately needed a “British fired first” incident to bring to the Congress, lest passions for revolution and war wane. Here is a HIGHLY condensed summary of my article. • Artists’ depictions of the battle gradually evolved–from showing all colonists retreating, to all defiantly resisting. • The original 1775 depiction [above] represented how Massachusetts rebels wanted the event then portrayed: unprovoked slaughter. The newspaper MASSACHUSETTS SPY denied the militia fired ANY shots, even retaliatory. In their depositions, no Lexington militiaman expressly admitted firing shots. • As 50th anniversary celebrations approached, the truth began emerging. Residents of neighboring Concord boasted their town should be credited with firing “the shot heard round the world.” The outraged Lexington’s denizens insisted the honor was theirs. They obtained new depositions from the Lexington battle’s aged veterans. In a turnaround, deponents now insisted, they fired at the British, though claiming the redcoats BEGAN hostilities. • British reports that the Americans fired first are credible. Since the British admitted shooting first at the subsequent Concord battle, why lie about Lexington? Redcoats said the Americans fired first in diaries not intended for publication. And the militiamen amending their depositions weakens their credibility. • The night before the battle, Joseph Warren dispatched Paul Revere on his famous ride from Boston. Warren sent another rider, William Dawes, and both arrived at the Lexington house where John Hancock (left) and Samuel Adams–leaders of the revolution in Massachusetts—were staying. 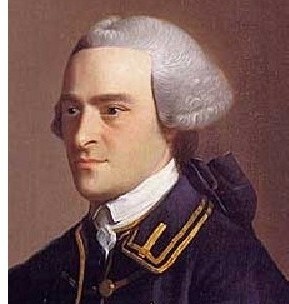 Adams had recruited smuggler John Hancock, wealthiest man in Massachusetts, to be the revolution’s financial angel. What history books omit: Warren was Grand Master of St. Andrew’s Freemasonic Lodge in Boston; Revere, Dawes and Hancock belonged to that Lodge. After the war, Revere became Grand Master of the Grand Lodge of Massachusetts. • During the French and Indian War, colonists and redcoats fought on the same side. Britain’s national debt nearly doubled by the war’s end (1763), and Parliament felt British taxpayers should not bear it alone. It felt colonists should contribute since they were the war’s main beneficiaries. Britain’s willingness to repeal each revenue measure (Sugar Act, Stamp Act, Townsend Acts) shows more amenability toward colonial protests than commonly believed. • Adams was instrumental in changing Americans’ perception of redcoats to “the bad guys.” Adams became Boston’s virtual dictator, controlling it through organized mobs. “Tories” (British loyalists) had their homes looted and even destroyed, and their bodies tarred and feathered. These mobs could not be brought to justice. Massachusetts governor Thomas Hutchinson said he doubted if there was “a man of greater malignity of heart, or who less scruples [in using] any measure ever so criminal to accomplish his purposes” than Sam Adams. • Adams’s antipathy to these troops led to the orchestrated “Boston Massacre” (1770), in which a mob of several hundred attacked nine British soldiers until they fired in self-defense. Collected depositions, and Paul Revere’s infamously misrepresentative print, portrayed it as unprovoked slaughter of innocents. • By 1773, England eliminated all taxes on America save a nominal duty on tea of 3 pennies per pound. This tea was so cheap, it undersold the tea John Hancock was smuggling in. The Boston Tea Party conveniently destroyed the merchandise of Hancock’s competition. 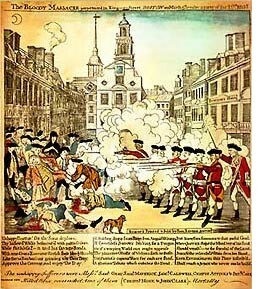 • What a coincidence: The night before the Lexington battle, Adams, Hancock and Revere–apparent mastermind and chief propagandists of the “Boston Massacre”–met in a house a few hundred feet behind Lexington Green. Early that morning, Adams and Hancock walked to the green and spoke to the militiamen at Buckman’s tavern. • Contrary to common sense–and behavior of other militias (who fired behind trees and walls) –the grossly outnumbered Lexington militia stood openly in parade formation. The British, marching into the trap, had no choice but to confront them. • Based on British reports, more than ten shots were probably fired at them before they began disorderly return fire. • The opening shots came mostly from men in concealed locations, which set up the militia on the green to absorb the British reaction. • Testimony exists that the shots were NOT fired by local militiamen, but separate gunmen whose identity remains unknown. • Paul Revere himself was at the green when the British arrived. Revere said he went with John Lowell (fellow St. Andrew’s Freemason) to fetch Hancock’s trunk at Buckman’s Tavern. British reports said the first shots came from the corner of the tavern, where Revere had been only MOMENTS before. • Parallels between the Boston and Lexington “massacres” were uncanny: similar artistic depictions, questionable depositions, dishonest newspaper accounts. • Despite the Minutemen’s famed marksmanship, the shots fired on the British at Lexington failed to score one significant hit. My article suggests this may have been intentional–dead redcoats would have spoiled the “massacre” story that helped drive the continent to arms. May 2, 2017 in GLADIO: Psy-ops & False Flags.